Peregrine Church is a Seattle-based creator who spends his time thinking of ways to make the world a more interesting place. He is the creator of Rainworks, street art that only appears when it’s wet. 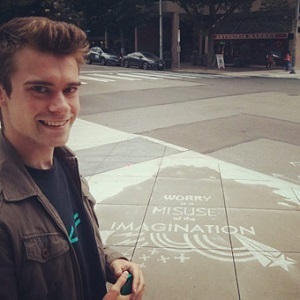 He began decorating the streets of Seattle with his rainy-day art in May 2014. In early 2015, a video featuring Rainworks went viral, netting over 15 million views between Youtube and Facebook. Since then, Peregrine and rainworks have received worldwide recognition and media coverage. Recently, Peregrine launched a Kickstarter campaign as an effort to distribute the spray used to make rainworks. The campaign ends on September 20th, and Peregrine is hoping to raise $50,000 to get his new endeavor off the ground. Summary: Peregrine’s answer to the five questions! Listen to the full conversation on the player above; also available on iTunes and Stitcher. Hope, simply defined, is the feeling or belief that things are going to be okay, things are going to work out as you wish them to, as you hope they do. The biggest person telling me to keep hope or keep remembering that you can do something with the time you have is me. I have role models that I look up to who have done incredible things and they did that just my managing their time incredibly well and using their time incredibly efficiently. I’m inspired to be efficient like them. I’d say the biggest struggle I have is with myself – trying to be the best person I can be because that’s my goal in life. It’s to fulfill as much potential as I can to do what I’m able to do. My biggest frustrations are when I’m not doing that where I realize that I have spent an entire day or past two days browsing YouTube watching pointless videos or enjoying a TV show. When enough of that goes by, it hits me like, God I’m wasting my life. I have so much potential. I can learn skills and apply them to make people’s lives better or improve myself and I‘m just lodging out in my bed with a computer. That’s one of the biggest struggles I have. I’m lucky enough to not struggle with any sort of disease or bad relationships. My biggest struggle is with my I guess motivation. I remember the night of my 18th birthday, walking outside and finding a spot alone and just crying because I was 18 years old and I hadn’t been doing as much as I could. I’m like, why am I not learning more because I can, I physically can. It’s just that for some reason I am choosing to waste time. What I have to remind myself in those situations is that no use crying over spilled milk. You can’t change how you spent your time in the past. I have to tell myself the only way is forward, forward in time literally and also the only way to get better is to take action in the future. I have to forgive myself for the way I spent my time. If I spend more time being angry at myself for the time I wasted, that’s also wasted time and that’s just pointless. That’s even worse. Now you’re wasting time and not even being entertained by YouTube. If it happens again, accept it, it’s happened and remind yourself to move forward. I like to remind people that they can do whatever they want to. When someone says “I wish I could do that, but I’m just bad at it”. I’m like, well yes, but that’s not a permanent condition. (1) I like being the little weird thing in someone’s day that breaks up the monotony that can make souls decay. (2) Inspire people to do stuff.